Andrew Clements (played by Jerry O’Connell) was a normal 14-year old boy: he loved comic books, was girl crazy, was next-door neighbors with a zany scientist that is the fourth smartest man in the world who accidentally created an invention that accidentally gave the boy super powers.What’s that you said? Fourth smartest man? That’s not very normal.Well, it’s certainly nothing out of the ordinary for a Canadian Action/Adventure-Sci Fi television series imported to the United States during the late 80’s to early 90’s. You guessed it: I’m talking about none other than MY SECRET IDENTITY. 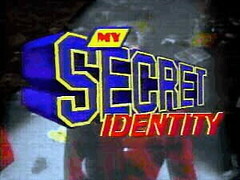 My Secret Identity is another one of those junky television shows that I utterly adored when I was a youngster. It was about a boy who accidentally zapped by “proton beam” (not a very descriptive name — one could describe a flashlight as a “photon beam”) and later discovered he had developed super powers as a result of this. Andrew could float (not fly, really), had super speed, and initially was completely invulnerable. Later in the series a second zap made him vulnerable, but gave him super strength.What was awesome about this show is that Andrew was just a kid, and could have easily used his powers to get ahead in life, but he didn’t. Instead, Andrew used his abilities to help out people who needed it and took no credit or glory for himself. In fact, Andrew never once was seen using his powers, except by some kid who was terminally ill. Andrew treated him to some floating/flying and the boy was never heard from after that. One of the running gags in the show was Andrew trying to get someone with him to go away, or turn around so he could save the day without being noticed.My Secret Identity only ran for four seasons, and when it vanished into TV obscurity it took a tiny piece of me with it. Okay, that may be a little dramatic, but I am sad it went away before I could make a sweet fanpage like this one.